When is your bashert selected for you? According to the Babylonian Talmud (Tractate Sotah 2a), forty days before a Jewish child is born, G-d chooses that child’s future spouse. This person is called a bashert. A bashert is one’s soul mate. In the Jewish tradition, if you have not yet been united with your bashert, you have a very auspicious day to look for that person. That day is Tu Be’Av. Tu Be’Av, the fifteenth day of the month of Av, was the holiday of the grape harvest during the times of the Temple in Jerusalem (957 BCE — 70 CE). On this day, marking the beginning of the grape harvest, there was a grape festival called Hag Hakeramim, the holiday of the vineyards. Unmarried young women would wear white dresses and dance in the vineyards, hoping to attract a husband (Babylonian Talmud, tractate Ta’anit 30b-31a). This holiday has been revived in modern Israel as Hag HaAhava, the holiday of love. This year, Tu Be’Av begins at sunset on August third. You can bring the magic of Ancient Israel’s vineyards into your life with a romantic Tu Be’Av dinner. Set the festive tone by serving good wine since, “wine gladdens the heart of the human being” (Psalms 104:5). For this very special Tu Be’Av dinner, I wanted to make sure that I would recommend the right wines to accompany the food. I turned to Reuven Ribiat, the proprietor of Rosenberg Judaica and Wine for advice. His store offers one of the best international selections of kosher wines that I have seen in the greater Philadelphia area. Reuven is very knowledgeable. He selects all the wines sold at the store, and often visits the wineries he sources them from during his travels. Begin your Tu Be’Av dance in the vineyard with an appetizer of figs and goat cheese. The fig is an ancient symbol of fertility, sweetness, and abundance for Jews. 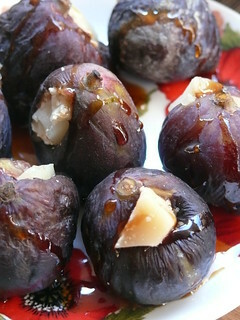 Call out to your intended with this roasted fig appetizer. Rub the figs with olive oil. Cut an “X” at the top of each fig. Scoop a tablespoon of goat cheese into the fig. Bake in a 400 degree Fahrenheit oven for about ten minutes, or grill on a barbecue. Serve with a bottle of chilled Chenin Blanc. Continue your dance by serving a dish which symbolizes fertility and good luck in the Jewish tradition. 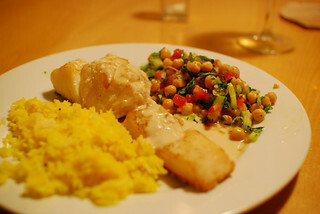 For the main course, serve a Mediterranean fish, enveloped in a seductive tahini sauce. Brush the fish with olive oil, and sprinkle some salt on it. Bake the flounder for 15 minutes. Take the fish out of the oven, and let it rest while you prepare the tahini sauce. In a bowl, mix the tahini with about two tablespoons of warm water. Beat in the crushed garlic. Add one tablespoon of olive oil. Whisk in the juice of the two lemons. Taste the tahini to see if you like it. Adjust the seasonings. Spread the tahini sauce over the fish. Cover the fish with the onion slices. Bake for 25 minutes in a 325 degree Fahrenheit oven. Serve with rice, a green salad, and chilled Sauvignon Blanc or Pinot Grigio. Conclude your dance by melding some of the world’s greatest known aphrodisiacs together in one dish. Chocolate, brandy, and nuts combined into one sensational cake! This cake is best baked in advance to allow all the flavors to develop. Pour into a baking pan that has been rubbed with butter and sprinkled with flour. Bake for 55 to 65 minutes. Combine all the ingredients in a pot. Stir over low heat until the sugar is dissolved. Do not boil. As soon as you pull the cake out of the oven, invert the pan onto a cooling rack. Poke holes all over the cake. Brush half the Grand Marnier Syrup on the cake. Invert the cake onto a serving platter. Brush the rest of the syrup on the cake. Allow to cool completely at room temperature. Place the chocolate chips in a bowl. Heat the heavy cream in the microwave. Pour the hot cream over the chocolate chips. 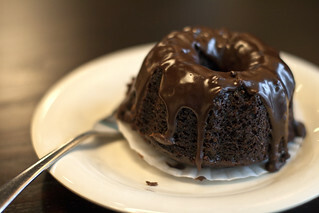 Seal the cake in an airtight container, and refrigerate until ready to serve. If this day turns out to be propitious and you should meet your bashert, how can you end your celebratory meal? Reuven Ribiat tells me that champagne is the wine of love. Raise a glass of your favorite white or rose champagne. L’Chaim! May you be blessed with chuppah!